It is common knowledge that exercise is good for your health, but did you know that exercise is just as important for your mental health? The human body was simply not designed to do as much sitting as most of us now do, between our jobs, commute, and time spent in front of TV/computer screens at home. This increasingly sedentary lifestyle has led to increased rates of diabetes and obesity, but also more anxiety, depression, and insomnia than in previous generations. According to this article, “exercise also seems to mimic some of the chemical effects of antidepressant medication.” Hey, think about that sentence for a moment: isn’t it more accurate to say the opposite, that antidepressants mimic the chemical effects of exercise? Which came first? The most common complaints about antidepressants are that they cause weight gain, loss of libido, and seem to lose their effectiveness after a few years of regular use. Exercise has the opposite effect: it is more likely to lead to weight loss and increased libido; and the longer you do it, the more effective it is. Furthermore, it doesn’t require a prescription, and the cost can be minimal (a good pair of walking or running shoes is all you need to start). The research on exercise as a treatment for anxiety is less conclusive, in part due to fewer studies, and because different forms of exercise are indicated for different types of anxiety – e.g., people with social anxiety benefit from exercise via structured group activities, whereas someone with panic disorder may need to work out solo in a medically supervised setting. However, no studies have shown that exercise makes anxiety worse, and since anxiety often co-exists with depression, and responds to antidepressant meds, it is logical to try exercise for anxiety relief. Here the research gets even more complicated. While it is clear that exercise nearly always leads to better sleep in people who don’t have sleep problems, among those who do, the immediate effect of exercise may make their insomnia worse. However, this effect disappears over time, after a few months of regular exercise. In other words, one day of exercise might rev you up instead of calm you down, but if you stick with it, exercise will improve both the quality and quantity of your sleep. 5. Try one of these: SoulCycle, Zumba, Nia, or Five Rhythms dance. If you love exercise but “have no time,” then you may need to get creative to find a way to fit it into your busy schedule. Perhaps you may also need to give up on the idea of doing it perfectly, or the way you used to. One of my clients, a working mother with two young children and no time for the exercise classes she used to enjoy, was inspired to try family “dance parties” in her living room a few afternoons a week. Her kids loved it, and she not only worked up a sweat, but felt happier afterward. Exercising with other people is often more fun, can help with motivation, and increases production of “feel-good” chemicals in the brain. If you have a disability or chronic illness that limits your energy or ability to participate in group or outdoor activities, you can still find a way to exercise. When I was young and could count on two hands the number of TV channels, there was a “Sunrise Yoga” program on my local PBS station. In today’s “500-channel universe,” there are undoubtedly multiple options for yoga and exercise programs available to you through your TV, tablet, laptop or smart phone. See what you can find! Remember, the research shows that it takes 60 – 90 days of regular practice to install a new habit, whether you’re trying to learn to meditate, play an instrument, or eat less and exercise more. 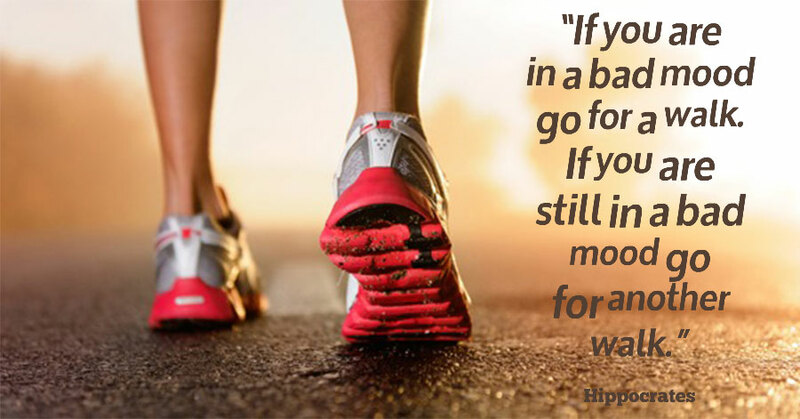 So just get moving – and tomorrow and the next day, do it again. Previous How Are You Sleeping These Days?